The above chart shows the relation between the 2-year bond spread (U.S. - Japan) and USD/JPY exchange rate. 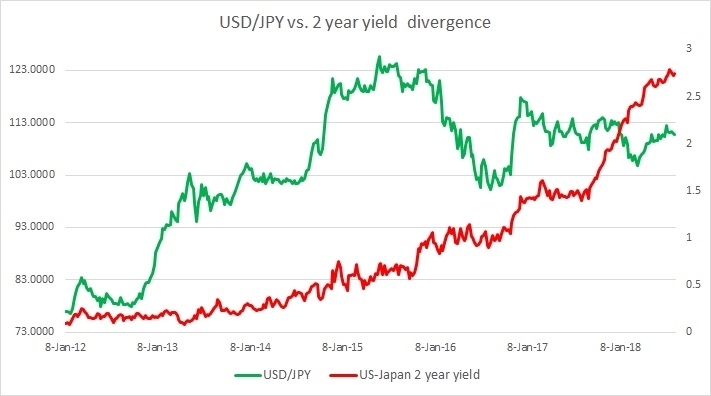 This one pair has been at odds with yield divergence throughout early 2016 as the yen benefited from risk aversion and due to market participants’ doubts on BoJ’s abilities to ease policies further. It had shown excellent response to the yield divergence in the past, especially after the Bank of Japan (BoJ) announced its quantitative easing program back in 2012. The close relationship lasted till the summer of 2015. US-Japan 2 year yield spread rose from 0.13 percent in 2012 to 0.72 percent by May 2015 and hovered there till October and the exchange rate reached from 76 to 126 in that same period. However, trouble started surfacing after summer. We guess it was triggered by surprise devaluation of the yuan by the Chinese central bank, People’s Bank of China (PBoC). The yield spread kept rising in favor of the dollar. The yield spread rose more than 30 basis point since summer, but, the yen has strengthened from 126 to as low as 98. After Donald Trump, the Republican candidate secured a victory in 2016’s US election the exchange rate started to respond to the yield difference once more. After Mr. Trump’s victory, the yield gap jumped suddenly by more than 25 basis points and the yen weakened to 114 per dollar from as high as 101 per dollar. In our evaluation in August, we noted that both the spread and the exchanged rate have changed by a small amount. The spread narrowed by 6 basis points in favor of the yen and the yen has strengthened by 100 pips against the dollar. The spread was trading at 145 basis points (US-Japan) and yen at 109.9 per dollar. In our review in Mid-September, we noted that the spread has further widened by 13 basis points in favor of the dollar and the yen has weakened by almost 280 pips against the dollar, thus reducing the divergence to some extent. The spread was then at 157 basis points (US-Japan) and the exchange rate was at 112 per dollar. In our review in late October, we noted that the yield spread has further widened by 17 basis points to 174 bps in favor of the dollar and the yen has weakened by more than 110 pips to 113.2 per dollar. In our November review, we noted that the yield spread has widened further by 21 basis points to 195 bps but the yen has strengthened by 70 pips to 112.5 riding on risk aversion. In our mid-December review, we noted that the spread has widened further by 8 basis points and yen has weakened by 65 pips. The yen is currently trading at 113.1 per dollar. It is important to note that since August, the spread has started widening sharply from 140 bps to 201 bps and the yen has weakened from 109 per dollar to 113 per dollar. In our January review we noted that the spread has widened by almost 22 bps to 222 bps in favor of the dollar, however, the yen has strengthened against the dollar by more than 400 pips and was then trading at 109 per dollar. In February review, we noticed that the spread has widened by almost 20 bps to 242 bps in favor of the dollar, while the yen has strengthened further by 120 pips to 107.8 per dollar. In our March review, we noted that the spread has widened by 3 bps to 245 bps in favor of the dollar but the yen strengthened sharply against the USD rising on risk aversion to 105.7 per dollar. In our April review, we noted that the spread has further widened by 16 bps to 261 bps, while the yen weakened from 105.7 per dollar to 109.3 per dollar. The divergence is still quite large. In May, we saw that the spread has marginally widened by 4 bps to 265 bps and the yen has weakened to 109.4 per dollar. In June 2018, the spread further widened by 5 bps to 270 bps and the yen weakened to 110.5 per dollar. In July, the spread further widened by 2 basis points to 272 bps and the yen weakened by almost 200 pips to 112.4 per dollar. The divergence has continued to widen and in August the spread further widened to 275 basis points, while the yen strengthened by 170 pips to 110.7 per dollar riding on risk aversion. Every time, the risk aversion fades, yen would respond by weakening against the USD, as the divergence is still quite large.